Fittingly, it was a solo – Eric Turkewitz – who broke the story of Supreme Court nominee, Sonya_Sotomayor‘s foray into solo practice under the firm name, Sotomayor and Associates –impermissible name under New York ethics rules given that Sotomayor did not have any associates working for her firm. The issue has created enough of a stir to cause White House officials to scramble to Sotomayor’s defense. Though it seems to me that Sotomayor did violate New York ethics rules, that should hardly disqualify her from a seat on the Supreme Court. That Sotomayor apparently gave little thought to naming her firm is not surprising; most lawyers in public service or even biglaw practice simply aren’t aware of the dozens of nitpicky, gotcha type bar rules that all kick in, full force when you start a practice. Not tomention that back in the 1980s, Sotomayor didn’t have the benefit of blogs such as this one, where I discussed the restrictions on use of “and associates” (as well as restrictions on use of the term law firm to describe a solo practice) far back as 2005. In any event, the law hasn’t changed much from when Sotomayor opened her practice. Earlier this month, Minnesota Ethics Board issued a decision prohibiting law firms of one from using “and associates” in the firm name. The Board noted that its decision was consistent with similar rulings in South Carolina, Wisconsin, Ohio and Utah. I can’t say that I disagree with the rulings – after all, if a firm doesn’t have any associates, it’s prima facie deceptive to pretend that it does. At the same time, as we move towards virtual law firms and outsourced contract lawyers, some of these decisions may have a limited shelf life. For example, if I use a virtual assistant and contract attorneys, would use of “and associates” be accurate in that situation? What about Team Elefant Law Firm? The bar rulings need to be flexible enough to accomodate all of the hybrid law firm arrangements coming down the pike in the future. But as for the present, Sotomayor’s case teaches that in solo practice, our past can always come back to haunt us at the most inopportune times. 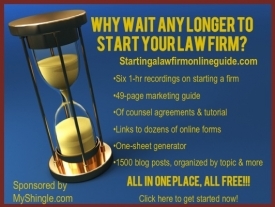 Though understandably, many unemployed lawyers would like to throw together a law practice simply to have something to do, starting out, it’s important not to cut any corners. After all, like Sotomayor, you never know when your law firm’s name may be front page headlines.